Yesterday’s tournament was plenty of up and downs. The champion, LewiiAbz7, a first-timer, used Real Madrid and Bayern Munich withing his first three matches at the group stage. He kept At. Madrid for the final against Danarc who used Sevilla. Rafunes ended up 3rd after defeating Benz in the 3rd place match. At the end of the night, he confessed that it had been the closest he’s been from a Fifapub victory ever and still rememberd his semifinal match. Next time. Benz already knows what being the champion is, but we’re sure he’ll keep on trying to repeat it. This time Catalin (nw_asssassin) couldn’t reach semifinals as he had been doing in the first three tournaments. In the consolation final, he beat Filipewe10 (1-0) in the 90th minute. 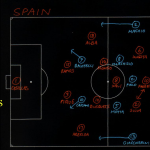 You’ll play in a group of four and then everyone will go to KOs (with consolation bracket). These tournaments are the first ones of a series of 16 tournaments where the top 4 players (not already qualified) will qualify directly for the FIFAPUB WEEKENDS Finals for free. We’ll be streaming all the tournaments with live commentators and interviews, so you can follow all the action when you are at home or share the joy with your friends so they can follow your performance when you’re playing. With every ticket you buy, you’ll get chances to win a FIFA 16 copy (there will be 4 copies and the draw will take place during the Finals’ weekend). You will need to buy your Fifapub Wristband (£2) then you can buy as many tickets as you want for £3 each. If you lose your Wristband you’ll need to pay again. Each Wristband has got a colour. There are 8 different colours, each colour represents a team. The points that you get will go directly to your team/colour. At the end of the FIFAPUB WEEKENDS each person who has been member of the winning team will get a FIFAPUB Champions T-shirt, with the names of each member at the back, ordered by ranking. Are you ready for it? Of course you are, bring it on! The date is already confirmed happening the 28th of February. We’ll be there since 12pm waiting for the qualified teams to confirm their invitation and it will kick off at 1pm. 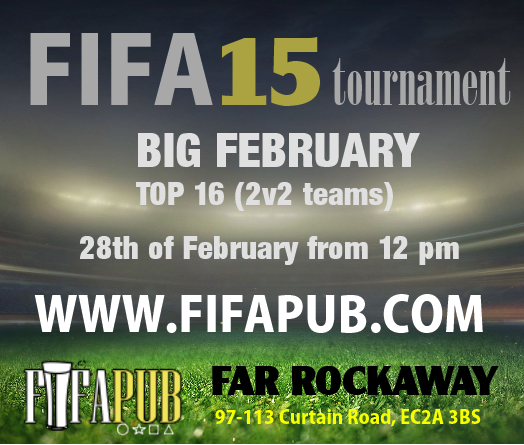 As you may know, the TOP 16 2v2 teams by the 28th of February are invited to participate in this tournament. But in case any team cannot make it, the next teams in the ranking are able to get the invitation in strict ranking order. If you still don’t know how to get points you can read this article (How to get points?) but it seems that the rankings are still wide open. The good point is that even if you don’t manage to qualify for this event, you might get it in two months, by the end of April in our second special tournament of the year: APRIL FEVER. Remember that you can still make it, just find a partner a come along during the last two weeks. Also, as you already know, the Handicap system allow to enjoy our qualifying tournaments to everyone since the best players play with bad teams while the casual players can use much stronger combination of teams. 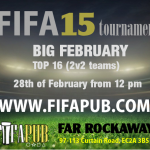 Fifapub has started the year 2015 with a few new rules to level the things up. We want tight events but we also want to know who are the best players so we’re bringing the first special tournament at Fifapub, so you better read the rules, find a partner and come along. 1v1 teams will also get stars discounted and added while they play in our tournaments, but they won’t be able to get qualified. At least not this time. Starting from this 2015 FIFAPUB will have a handicap system in a similar way golf has it. The better you perform in our tournaments the less stars you’ll have to pick your teams in following events. However, you’ll have more points to qualify for our special tournaments where bigger prizes will be given. In the same way, the worse you perform the more stars you’ll have for the next events, which will level the things up and at the same time will let us know who are the best players. HOW CAN I GET QUALIFIED FOR THE SPECIAL TOURNAMENTS? 1) Your team will get 10 points points per every star it has under the initial 22. Example: Your team has got a final handicap of -2 stars, so it will have 20 stars and 20 points. 3) Your team needs to play at least in 2 tournaments between tournaments to be able to get qualified. Example: My team has played 3 tournaments (15 points) and due to our good results it has a budget of 20 stars (20 points), so that team will have 35 points. In the case of a tie, teams with the highest rating will get qualified (check the RATING department below). Every time you play a game, it will affect to your rating. We use a system similar to the one used in real football. So if you lose or draw against somebody worse than you, you’ll lose more points than if you lose or draw against somebody better than you and viceversa. If you beat somebody better than you, you’ll get more points than if you beat somebody worse than you. The rating will allow people to qualify for the big tournaments, where you can win proper prizes. Every two months we’ll be hosting our special tournaments where the top 16 2v2 teams will get qualified. If a player is qualified in more than one team, they will qualify just with one team. We usually recommend you to play with your best team but it’s totally up to you as long as there aren’t more than one team qualifying per person. In order to be qualified as a team, you need to play at least two tournaments in the qualifying window (2 months) except for Big February where the minimum is always ONE tournament. The special tournaments will have 4 groups and it will be played as a normal 16-teams tournament. 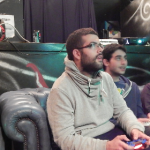 First time at Fifapub and their first victory: Intoxicated Workers (BIGGEORGE and Craigos10) got the victory in this week tournament at The Dog Star. Paradoxically, they played against One Hit Chuckers (lfcdk and midtfc), the opener of the tourney. In that match, the Danish pair came back 2-1 to get the win. The Final had the same result but different outcome and Intoxicated Workers won 2-1 using Real Madrid against FC Bayern. Great match. Matador, another first timer, had played brilliantly during the group stage but couldn’t show his best performance against the winner team in SF and lost 2-0 (PSG vs Juventus). One Hit Chuckers took revenge of The Wet Legs (Hammy103 and Abz_89) and let them out of the way in SF 1-0 (Real Madrid vs Barcelona) we are sure that this won’t be the last chapter of this rivalry. Intoxicated Pals (ManchesterCity and Utopico) didn’t play well during the first rounds of the tournament but end up winning the consolation final, two good results in a row giving them a boost of confidence. Similar thing happened with EcuaJefe who won his first match at the consolation Semifinal but couldn’t repeat the same result in the final. Nick1990 and Silly Aces (Femi_r and Anton) played better during the group stage than during the rest of the tournament. Maybe they just lost concentration at some point. They should get better results in their next tournament, anyway. For the first time in the last 5 tournaments, The Wet Legs (Hammy103 and Abz_89) didn’t reach the final. This time Intoxicated Pals (Utopico and ManchesterCity) defeated them with a last minute goal and gave the pass to the Finals. However, the Italian pair couldn’t lift the trophy this time. SamcoANINFENG had kept Real Madrid for the last match and won the game easily. It wasn’t easy for him to reach the finals though. Second in the group stage, winning 1-0 in QF and SF, but keep the best team for the last did pay off this time. Myltik had a clear challenge and was about to make it happen. He wanted to win the tournament playing just with Russian teams. His beloved CSK couldn’t help him to reach the finals in this occasion, as it had done it before and lost against the final winner just 1-0. Also, as we said at the beginning of the review, The Wet Legs failed to score in SF and fell in the last second of the match. Arsenal 0 – Manchester City 1. Impressive mark, anyway. Hit for punks (Speechlesshack and Frangtv) two first timers, won the consolation final. They got it going through the championship, since at the start they struggled a little bit to finish at very good shape. Two good players playing together for the first time, that was it. William08, also a first timer, was pretty close of grabbing his first consolation tittle. He came from Paris just two weeks ago and now it’s ready to be a top contender at Fifapub. Rightmidfield played well during the tourney and was about to beat SamcoANINFENG in QF, since he scored the first and the last goals of the match. Grosmatt22 couldn’t find his usual game, but he’ll cope, no doubt. See you soon at Fifapub. Full house at the Dog Star, 16 players that were going to fight till the end for the victory. 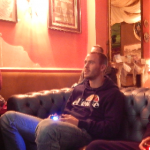 Mind Bankers (Kaziuk and Alexius2040) PSG and The Wet Legs (Hammy103 and Abz_89) Real Madrid faced in the Final. Once again and for the first time at Fifapub, a team wins three tournaments in a row. The Wet Legs didn’t find any difficulty on grasping the title after a sweet match (4-0). They just conceded one draw against Scissor Bubbles (Lewin and Saddek) at the group stage. 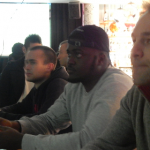 One Hit Chuckers (midtfc and lfcdk) and Silly Aces (Alex and Femi_r) were the semifinalists of the tournament. Silly Aces couldn’t too much against the winner team, although they played well during the tournament they struggled in Semifinals. One Hit Chuckers played better than Mind Bankers at semifinals, had several opportunities but the semifinal finished at 0-0. The penalty shoot-out stopped them to reach the final. Better luck the next time. 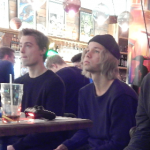 This Danish team is one of the best 2v2 statistically at Fifapub. In the consolation Final, Big Assassins (Fernando and Pasta) got the victory over Scissor Bubbles (Lewin and Saddek) 3-2. They are both quite even teams at this moment, but every small detail counts in a Final. A rainy evening in East London. 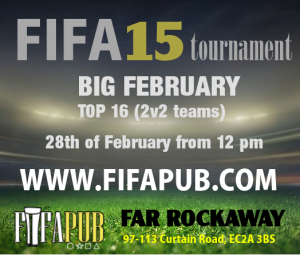 As usual we were at Far Rockaway hosting a Fifapub tournament. After their victory at the Yager one week before, The Wet Legs got their second victory in a row. This time against Lewin in an intense match. Hammy103 and Abz_89 used Real Madrid and Lewin picked Borussia Dortmund. In the 80th minute, The Wet Legs scored their third goal and the last of the match (3-2) to clinch the title. Andrewaziz26 and samcoANINFENG were our semi finalist. Andrew lost against the winners, after a good group phase in which he even used Newcastle in his first match. SamcoANINFENG played super good group phase but failed to make the final. Lewin beat him 1-0. However, in the group stage Sam had won 3-1 and probably he paid the fact of being too confident in that match. We are sure that Sam will win his first tournament sooner rather than later. Nonchalant Kings (landinho and lukeboy) won in the consolation Final 2-1 against Biting Hands (joefriel and joeljaggar). The result had been just the opposite at the group stage, but it’s always the same, what it matters in a knock-out phase is winning your last game. Who will win the next one?